Did you know that you can use margins and twoway contour to graph predictions from models that include continuous-by-continuous interactions? Well you can, and it is easy once you know about an undocumented option in margins. Graphs often can illustrate the results of a model more effectively than a written interpretation, especially for a nontechnical audience. This is particularly true for models with interaction terms. Stata's margins and marginsplot commands are powerful tools for creating graphs for complex models, including those with interactions. Today, I want to show you how to use margins and twoway contour to graph predictions from a model that includes an interaction between two continuous covariates. The nhanes2 dataset used below contains an indicator variable for hypertension (highbp) and the continuous variables age and weight. 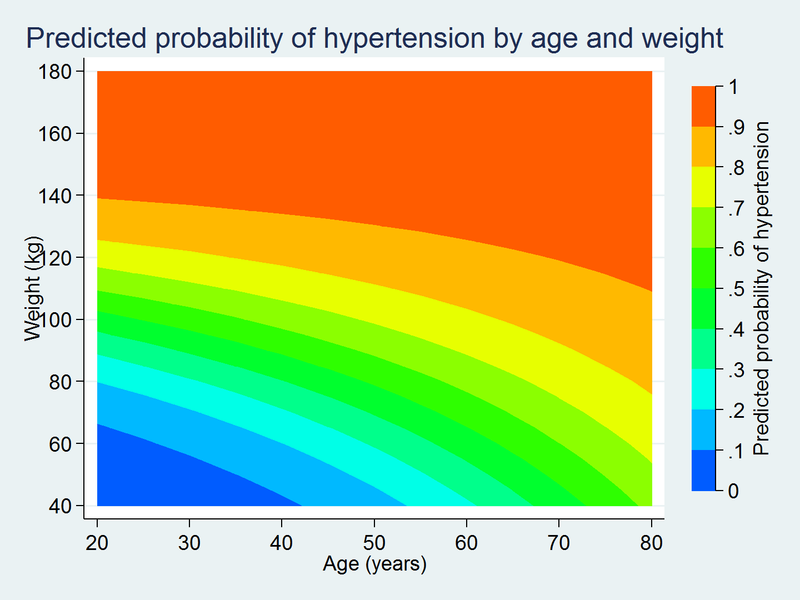 Let's fit a logistic regression model using age, weight, and their interaction as predictors of the probability of hypertension. We include the svy: prefix because this dataset contains survey weights. The logistic command automatically transforms the coefficients to odds ratios, which makes them easier to interpret. However, even this easier-to-interpret metric is not straightforward when we include the interaction of the covariates. 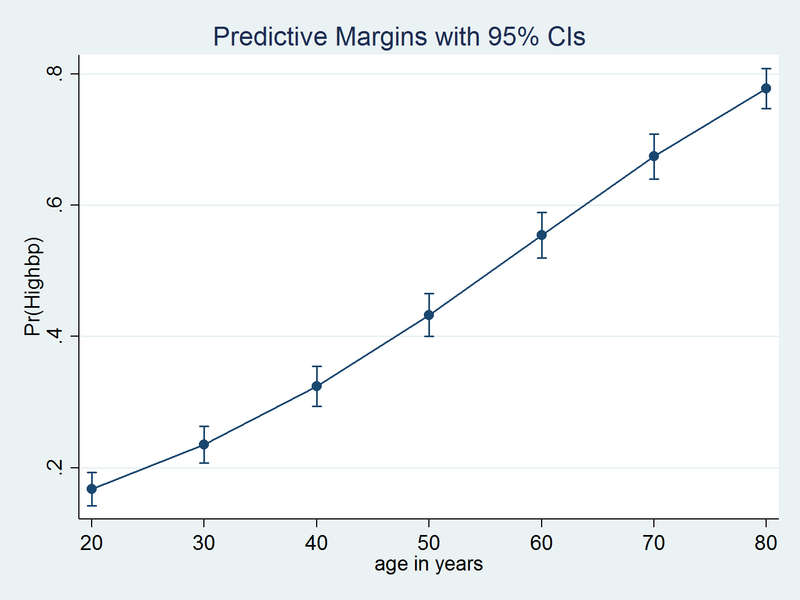 We can use margins and marginsplot to graph predictions from the model, which more clearly illustrates the relationship between age and the probability of hypertension. Because we have survey data, we include the vce(unconditional) option to obtain standard errors appropriate for population inferences. The average probability of hypertension increases with age. We can again use margins and marginsplot to graph the predictions over weight. Understanding the interaction of age and weight poses a serious challenge. The odds ratio for each individual variable is greater than 1, but the odds ratio for the interaction is less than 1. Actually, it is essentially equal to the null value of 1, but its p-value is 0.000. What does this mean?!? I am not going to attempt to interpret the odds ratio for the interaction term, but we can create a graph of the predictions from the model by using margins and twoway contour. We begin by using margins to calculate the predicted probability of hypertension for all combinations of age, ranging from 20 to 80 years in increments of 5 years, and weight, ranging from 40 to 180 kilograms in increments of 5 kilograms. We use the quietly prefix to suppress the lengthy output that results from this command. We also use the undocumented option saving(predictions, replace), which saves the results of margins to the dataset predictions.dta. The dataset predictions.dta contains the variables _at1 and _at2, which correspond to the values of age and weight that we specified in the at() option. The dataset also contains the variable _margin, which is the marginal prediction of the probability of high blood pressure. I prefer to use variable names that mean something to me, so I rename _at1, _at2, and _margin. Now we're ready to create the contour plot. Let's begin with a basic twoway contour to view the results. I like this graph, but I would like to customize it. 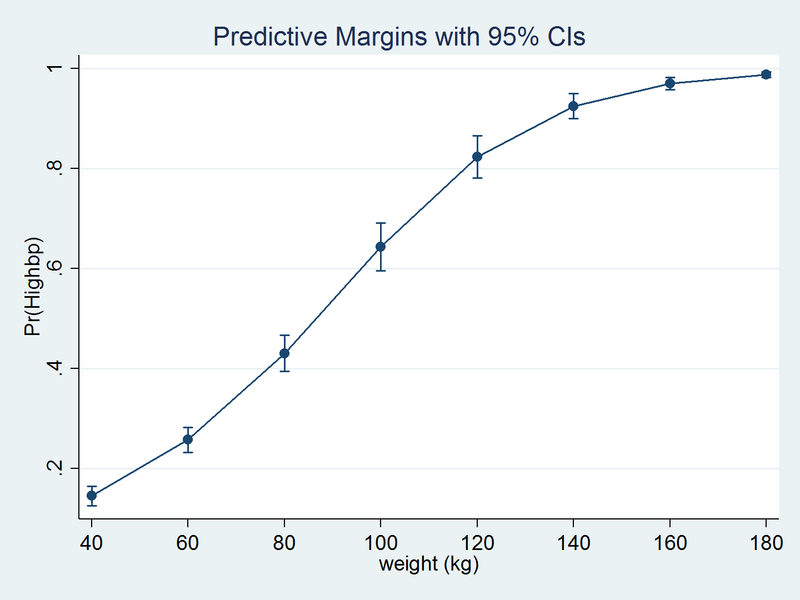 For example, I use ccuts(0(0.1)1.0) to view the predicted probability of hypertension in increments of 0.1. I also relabel the axes and add titles. 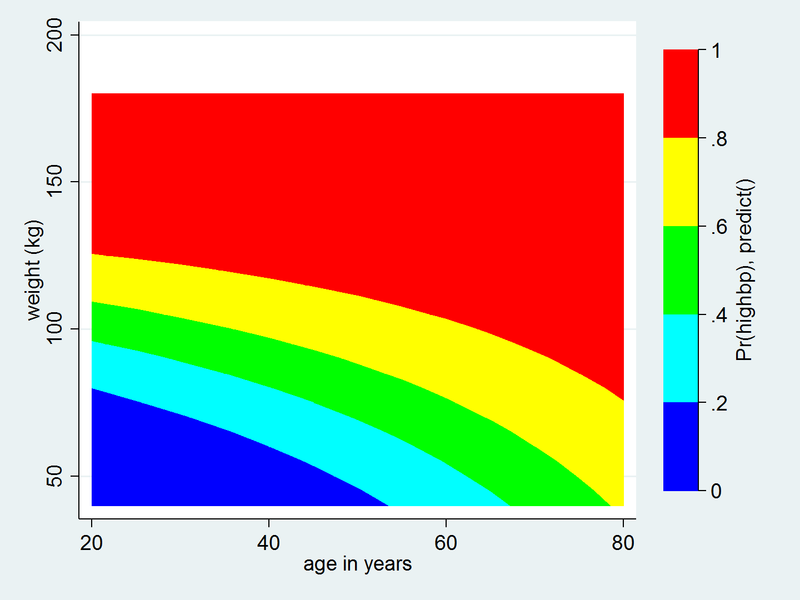 This graph is much easier to interpret than the odds ratio for the interaction term c.age#c.weight. The graph shows us that a 30-year-old who weighs 80 kilograms has a 30% chance of having hypertension, while a 30-year-old who weighs 100 kilograms has a 50–60% chance of having hypertension. Knowing a person's age alone does not give us enough information to predict their probability of having hypertension. We also need to know their weight. Similarly, the graph shows us that a person who weighs 80 kilograms at 20 years of age has a 20% chance of having hypertension, while a person who weighs 80 kilograms at 60 years of age has a 60–70% chance of having hypertension. Knowing only a person's weight does not give us enough information to predict their probability of having hypertension. We also need to know their age. The interaction term in our model causes the curvature of the contour lines in the graph. Without interaction, the contour lines would be straight. This curvature shows us how the effect of age on the predicted probability of hypertension differs across levels of weight and vice versa. margins and twoway contour make it easy to calculate and graph the predictions from the model. And the graph makes it easier to interpret the results. Note: This article was inspired by Bill Rising's talk at the 2011 Stata Users Group meeting in Chicago: Graphics tricks for models.